Running in the winter can be a definite challenge. Having trained most of my life in Maine, Providence, and Michigan, I’ve faced just about every cold weather scenario you can imagine. I’ve run in Gunnison, Colorado when it’s been -25 degrees below zero. I’ve done workouts so cold that frost literally clung to my facial hair. And I’ve raced in one of the coldest NCAA Championships in history. Luckily for you, all that experience leads to a wealth of knowledge when it comes to how to run in the cold weather. You can purchase or make your own special shoes that are designed to grip the ice and hard packed snow without sacrificing the comfort and stability of your favorite trainer. You can purchase a pair of Yak Trax from your favorite local running store, which clip on easily to the bottom of your shoe and work great. Get an old pair of shoes that are a little worn down but still have some mileage left in them (I recommend a pair with about 250-300 miles left on them). Head to the hardware store and pick up some hex head screws or sheet metal screws (because the head on them is raised that really grips well on ice). You don’t want flat head screws. 3/8″ screws are the best bet in my opinion. If you have a very thin shoe, or you are just paranoid about how thin the front of your shoe looks, then you can use 1/4″ long screws. Be sure to buy a lot of them however because they come out rather easily. Screw the screws into the shoe, pointy end first, so the hex head is the part sticking out. Remember, it is the head of the screw that provides the traction—not the point! Tighten the screw until the head is flush with the shoe and viola, you’ve got yourself the perfect screw shoe! I recommend using a drill rather than a screw driver, it’s much easier; you’ll have to press really hard with a screw driver. Put the screws wherever you want. As long as you don’t have air or an ipod in your shoe, anywhere works. Colleges and university roads are the places that clear snow the fastest. Why? Colleges and Universities have their own maintenance departments and are not dependent on the city. Plus, their paths are usually more for walking and there is less automobile traffic. The next fastest paths and roads to clear up are usually maintenance roads, where plows and salt trucks have to go back and forth; they are great if you can find them. Finally, run near schools (HS and elementary schools) since administrators clear roads quickly to get teachers and students safely to the classroom. These three places will be the quickest and most frequently plowed paths and streets in your city. Run against traffic when running on the roads (many times, sidewalks will not be clear enough to run, which may force you onto the road). When you run against traffic, you can see what’s coming at you, assess what the driver is doing or what they’re looking at, and determine if they see you. If worse comes to worse, you can dive into a snow bank. Also, remember that snow banks can get very high after a few snow storms and drivers may not be able to see you crossing the road. Pay extra attention when coming to intersections and when drivers are taking right hand turns. Run with the wind in your face on the way out and wind at your back the second half of the route. If you run with the wind at your back the first half of a run, you’ll get hot and sweaty and when you turn around, the wind will get very cold. Use Vaseline on exposed parts of your skin, such as your face, to help protect from the cold and wind. Vaseline is naturally waterproof and quite windproof. It will help keep your face from “falling off” in bitter winds. If you’re curious about how much running in the wind can impact your performance, check out the research we did here. 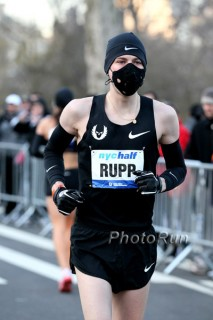 Galen Rupp took a lot of heat from running enthusiasts when he showed up at the 2011 NYC Half Marathon wearing a mask. While many onlookers thought he might be a ninja, or worse yet a bank robber, Rupp was actually protecting himself from allergies and the cold air. The cold, dry winter air can cause bronchial spasms, which restricts air from filling the lungs. Running in a light mask can help warm-up the air before it hits your lungs. You don’t want or need a beefy scarf, but a light mask can help filter the air just enough if you tend to have breathing issues, especially when you try to run hard. If you’re training for an important race, it is crucial that a snow day remains a small inconvenience, not a month long injury from slipping and sliding. It is much better to move a workout to a different day than end up tweaking a muscle you never knew you had, and ruining your entire season. Waiting a day can sometimes be the difference between a Winter of consistent and healthy training and a slew of injuries that lasts until Spring. If you run in slushy or wet conditions, put newspaper in your shoes immediately after your run. The newspaper will soak up the water and help your shoes maintain their structure. Do not put shoes in the dryer or the oven – it will shrink the material and lessen their shelf life. 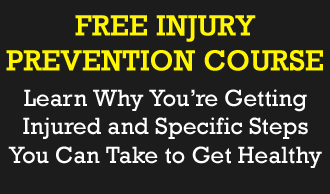 Also, be aware that the cushioning in your running shoes changes as it gets colder. Cold temperatures will stiffen the foam in the midsole and insole of your running shoes, changing their cushioning properties. Because your shoes are stiffer when running outside in the winter, they cause more localized pressure on the sole of your foot. In many ways, cold shoes are similar to shoes with a lot of miles on them: as shoes age, they also get stiffer as their EVA foam wears out. It may be cold and dry outside, and you might not think that you’re sweating, but you could be losing just as much fluid in the Winter as you do in the Summer. It’s important that you rehydrate after each run and stay hydrated throughout the day. You can measure exactly how much sweat you lose on your run with our handy sweat loss calculator for runners. Your body relies more heavily on carbohydrates and less on fats for its energy. Your lactate production is higher for a given intensity, indicating that you’re going deeper into “oxygen debt” to produce the necessary energy to maintain a given pace (as evidenced by a higher oxygen consumption rate in colder temperatures). Your muscle contractions are less powerful, which demands an increase in fast-twitch muscle fiber usage, perhaps explaining the higher lactate production. To help you stay on track with your running in any conditions, I’ve outlined some of my best tips and strategies and included them in a video and podcast. If it’s wet, find some latex gloves (check your first-aid kit) and wear those under the gloves. Latex is waterproof and will keep your hands dry. Gortex shoes if you have them. If not, wear the shoes with the least amount of mesh. Cover your face or mouth with a light breathable mask if you’re prone to coughing or your mouth gets very dry. 2 tops, 1 bottom. Long-sleeve base layer and a vest to keep your core warm. Half tights if you’re a polar bear. 2 tops, 2 bottoms. A jacket over your base layer. 3 tops, 2 bottoms. Two tops (fleece for the cold-prone) and a jacket. Windbrief for the fellas. 3 tops, 2 bottoms, extra pair of mittens, 1 scarf wrapped around mouth or a balaclava. 3 tops, 3 bottoms, 2 extra pairs of mittens, 1 balaclava, sunglasses. Wear tight clothes because they trap heat better and if they get wet, you can capitalize on your own body heat, much like a wetsuit. How do you adjust your running in the winter? What is your best tip for training during the colder months? Another place that quickly shovels its sidewalks is an outdoor mall. Just beware of slush or icy gutters. Interesting trick with the screws. Not sure I could be bothered to do that. 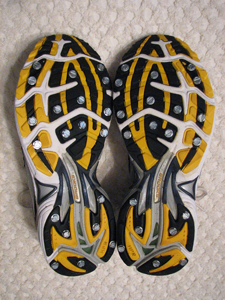 I use running Microspikes that are brilliant on compacted snow and ice. Lots of good ideas but not much about stocking caps and ear muffs. What would you like to see more of Steven? We would be happy to write up a post for it, but would not be able to recommend specific brands. Hands down the best winter running shoe is made by IceBug. It’s the only company that addresses the need for traction on all surfaces. I no longer avoid those wet icy patches. I can run right through without missing a beat. Check them out I think you all we be impressed.